The big rule of motorcycle travel (and most adventure travel) is to bring as little as possible. When you’re packing your bags, lay out everything you think you’ll need and then only take half of it. Motorcycle travel is about you, your bike, and the path. Having said that, you are going to need somewhere to store your essentials. For that purpose there are tank bags, saddlebags, panniers, sissy bar bags, motorcycle trailers, and even sidecars. There are many ways you can attach your belongings to your bike and everyone seems to have their preference. 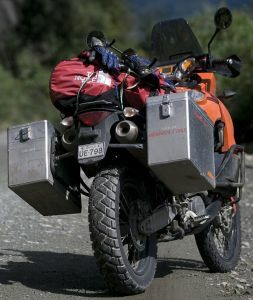 In the world on long-term motorcycle travel, I believe hard panniers are the best in terms of reliability, while detachable saddlebags are great when it comes to convenience and portability. Hard panniers should be able to take a beating as you’ll likely be dropping the bike if you come across some rough terrain and you won’t want the weight of it crushing your stuff. If you’re opting for saddlebags, you probably won’t be storing any breakables in there but there is always the option of fitting a cage around your bags (but that seems a little excessive in my opinion). Tank bags are essential for carrying items such as your electronics, important papers, maps, and some snacks too. You can get tank bags that attach to the frame of the bike or you can go for the magnetic attachments which are surprisingly sturdy. It is worth noting that all your bags and cases should be weatherproof. Sidecars provide the best way to bring along a partner but it isn’t the best choice for transporting your gear. A small trailer designed for motorcycles might be a better solution. They have the advantage of being detachable in case you want to go for a quick adventure ride in the sand or through some other rough terrain without the cumbersome weight of all your equipment. If you plan on going off the pavement for considerable lengths, I advise against them.